To Sum It Up: With the ley line now awoken, the search for Glendower, the sleeping Welsh king of legend, continues. The supernatural power that’s surging through Henrietta, Virginia is not going unnoticed by Henrietta’s residents, and it’s attracting attention from some keenly interested—and possibly dangerous—outsiders as well. At the same time, Ronan’s dreams, including the more nightmarish ones, are increasingly seeping their way into reality. Ronan’s talent isn’t as hidden as he thinks it is, and it’s about to impact not only him but Blue, Gansey, Adam, and Noah, too. Review: It’s time for another gushy, rambling review! I seriously cannot cope with the masterpiece that is The Dream Thieves. 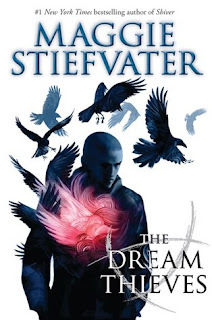 I kind of just want to say, “Maggie Stiefvater is astoundingly brilliant” and call this review done because I really don’t have anything else useful to add. Barring any last minute surprises, I’m almost positive that The Dream Thieves is going to be my favorite read of 2013, and believe me, there’s some heavy competition for that title. That is how superb this book is. When the first page of the prologue makes you feel giddy, you immediately know that the book you’re reading is special. The Dream Thieves is extraordinary. Maggie Stiefvater’s prose should be framed and displayed in museums everywhere. The perfection doesn’t stop with the writing, either. Sometimes I would pause from reading for a few seconds to marvel at the depth of this story and its characters and also at how the paranormal element is so intricately spun. You never doubt that it’s possible to take objects from dreams and bring them into the real world. You also don’t question the appearance of a new character known only as the Gray Man. He simply shows up as if he’s always belonged there, with zero interruption in the flow of the established story line. I trust Stiefvater implicitly with her storytelling; there’s a purpose to every character she adds and every word she writes, and it’s a thrill to wait and see how they all end up fitting together. Although the search for Glendower is a core part of the plot, the characters and the complicated relationships between them are what drive this series. I find the lives of Blue, Gansey, Ronan, Adam, and Noah absolutely absorbing, and that is why The Raven Boys and The Dream Thieves have worked for me so entirely. Reading about this group again was like seeing old friends; I’ve grown ridiculously attached to them and cannot read enough about them. It’s really difficult to explain exactly why this quintet compels me to extreme fangirling. They’re smart, they’re funny, they break my heart sometimes. I would give anything to be Blue, even for an hour, because 1) she’s so cool and 2) I’d get to hang out with the Raven Boys! While Gansey unquestionably remains my favorite Raven Boy, I adored Ronan in this book. He really takes center stage here, and I loved getting to know a lot more about him and his family. Of course, there’s also Chainsaw, the raven Ronan took straight from his dreams, and the bond those two have is so sweet. I chuckled for a good while at the scene in which Ronan, Gansey, and Noah take advantage of the “Pets Welcome” policy at a local dollar store and bring Chainsaw with them. Just writing about this scene has made me smile all over again. I feel like this “review” consists of nothing but babble, and that would be an accurate picture of my reaction to The Dream Thieves. Its awesomeness left me incoherent, and apparently, I still can’t scrape together a comprehensible review of it. So, I’m going to stop here and encourage you to read other five star reviews that make a lot more sense than mine does. All in All: I have an astronomical amount of love for this book and this series. I savored every word of The Dream Thieves, and it’s going to be an extremely painful wait until I can read about Blue and the boys again. I felt the exact same way! I read The Dream Thieves months ago and I still remember the prologue. That's practically unheard of when it comes to me! I thought the book was a masterpiece, and Gansey is my favourite too! The depth and atmosphere was astounding. I feel like Maggie Stiefvater's books are progressively improving and I'm so excited for the next one. Gushing definitely could not be helped with this book, lol. These characters are all so real, and I love that about them. And yay- another Gansey fan! That's how I felt about The Scorpio Races- the prose was pretty, but the story didn't grab me. I was hesitant to read The Raven Boys, but that one just clicked with me. I've seen readers disappointed with the pacing, but I'm perfectly happy with the series being more of a character study than a plot-driven one. I'm dying to read Shiver and to see how it compares to this series. I still need to read Raven Boys but it's on the top of my wishlist (especially since I happen to own Dream Thieves) so I couldn't resist checking out your review! I jumped over anything that might have been spoiler-y for me but I still appreciated all the love you have for this one - sequels can be hit or miss for me but this is super encouraging...and EXCITING! Thanks for the lovely review Lee! This one is as perfect as perfect gets as far as sequels go! I was literally dying for its release date, and now I'm dying for any news of the next book. It's definitely a slow-building series, but I don't mind at all because I find the characters so absorbing to read about. This book made me giddy, too! I agree with basically everything you said! Gansey is definitely my favorite, but I loved Ronan a lot in this book, and especially him with Chainsaw! I just love this series so much, and I'm so excited to see where it goes! And also slightly frightened, of course! I'm especially worried about Gansey; I love all of them, but I really couldn't cope with anything bad happening to him. And Ronan was so awesome in this book; his character development was just incredible!